1. To place a order, e-mail us your order information (include model name & quantity of the goods). 2. We will e-mail you the quotation as soon as receiving your order. 3. Please send the payment to us if you accept the quotation. 4. Please e-mail us your shipping address after you send the payment to us. 5. We will ship the goods to you after receive your payment. 1. Shipping way: All of the goods you ordered will be shipped to you by China Post(by AIR or by SAL). You can receive them in 7~14 days by air, 15~30 days by SAL, different days to different country. By Air: US$23 for <0.6kg, US$29 for 0.7~1kg, US$37 for 1~1.5kg, US$45 for 1.5~2kg, US$56 for 2~3kg, US$68 for 3~4kg, etc. For example, US$23 for 2 shirts, US$29 for 4 shirts, US$37 for 6 shirts, US$45 for 8 shirts or 1~2 rackets, US$56 for 10 shirts or 3~4 rackets, US$68 for 13 shirts or 7 rackets, etc. By SAL: US$16 for <1kg, US$25 for 1~1.5kg, US$30 for 1.5~2kg, US$39 for 2~3kg, US$50 for 3~4kg, etc. For example, US$16 for 4 shirts, US$25 for 6 shirts, US$30 for 8 shirts or 1~2 rackets, US$39 for 10 shirts or 3~4 rackets, US$50 for 13 shirts or 7 rackets, etc. By SAL: US$38 for 10 dozens, US$52 for 20 dozens, US$70 for 30 dozens, US$95 for 40 dozens, US$110 for 50 dozens, etc. By Air: US$60 for 10 dozens, US$91 for 20 dozens, US$137 for 30 dozens, US$166 for 40 dozens, US$170 for 50 dozens, etc. 1. You can send money to us online by Credit Cards on Western Union's website (http://www.westernunion.com). 2. You can send cash to us at Western Union's office, you can find your local Western Union's office on http://www.westernunion.com. 3. You can pay with Paypal, our Paypal account: bbeshop@sina.com. You must add 4% of total price as handling charge. 4. You can send money to our bank account by Telegraphic Transfer(Bank Account Transfer) in your local bank. You must add 18$ as handling charge. 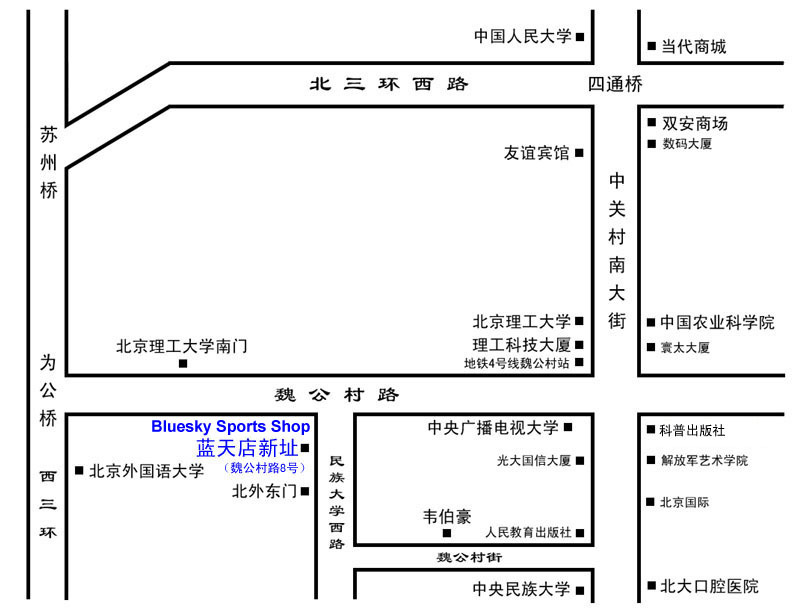 Bank Address: ZHONG GUAN CUN NAN DA JIE DISTRICT, BEIJING, CHINA. Floor 1st, Building 5, Weigongcun Road 8, Haidian District, Beijing, China. Thanks again for visiting our website. We welcome your feedback. If you have any questions or comments, please e-mail us.